On Monday we spoke to London-based artist Rachel Maggart about her most recent collection of paintings, now on show at Roast Restaurant, Borough. In this second instalment, Maggart tells us about a show she will be curating in the new year exploring sexuality in Islam. “I’m curating a show that will go up in March. That’s where my energies are going to go to now and it’s very much more socially orientated. 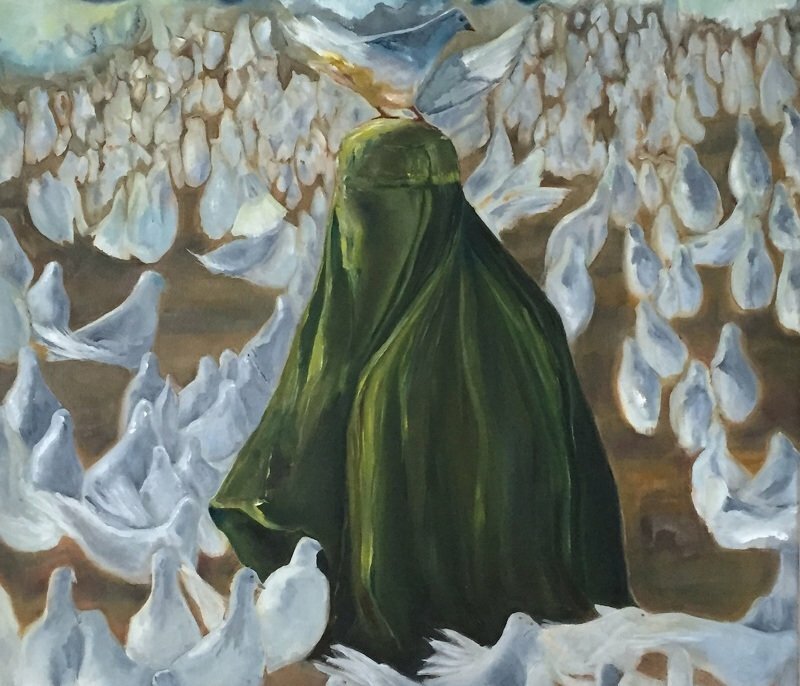 It’s for Quilliam’s first art season,” Maggart says. At this point I should mention that Maggart’s husband, Maajid Nawaz, is the founding chairman of Quilliam, the world’s first counter-extremism think tank, set up to address challenges of citizenship, identity, and belonging in a globalised world. It is not a project Maggart is undertaking lightly. “It will be an exhibition on sexuality and Islam which is quite a touchy, delicate subject but I think a lot has yet to be said about the false dichotomy between a good Muslim and one who is true to their own sexuality or celebrates their own sexuality. So we are looking at the misconception of Islam as contradictory to self-expression, how instead there is a history within Islam of sexuality on a spectrum. We are breaking open the myth that there should always be tension between the two,” she says. The exhibition will feature sounds and two-dimensional art. “I don’t think sculpture would work well in the space. It will be in a community space – a centre for literacy and free expression,” Maggart says. “We are not expecting everyone to have any art expertise or even be comfortable with coming into an art gallery. We want to make it very accessible. I have to ask her about how the practicalities of working with her husband. “We are a bit unorthodox – the idea of being with someone in our same industries scares the hell out of us! His work is so dangerous sometimes that I can’t help but take it seriously, it has to be on my mind just for safety. His life becomes my life and my life becomes his life. We have been together talking about ways of amplifying his cause through the arts and ideas of social cohesion and radicalisation as part of my work. It’s almost like a responsibility to do that right now. At a time when questions marks are flying thick and fast about Islam, such an exercise has never been more timely.